I am not the only picturing this with a smile on my face: Vatican, Sunday night, Pope Francis and Pope Emeritus Benedict XVI together in front of a TV wearing comfy slippers, beige and red respectively, and a bowl of divinely delicious popcorn between them. Whose prayer will be heard? This is one final I cannot lose as a fan. May the best team win! 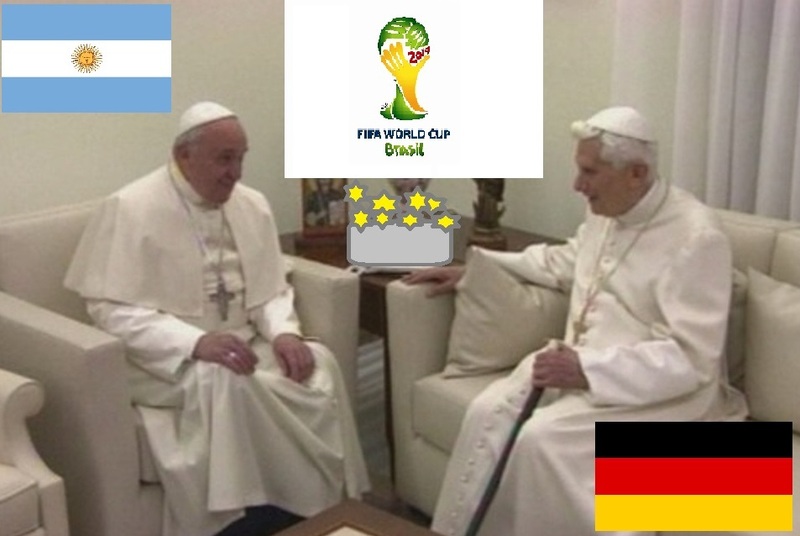 This entry was posted in Comments and tagged Argentina, FIFA, final, Germany, Pope Emeritus Benedict XVI, Pope Francis, Vatican, World Cup on July 10, 2014 by Karina. They will both probably be in bed in S. Martha and the Mater Ecclesia retirement monastery by at least 10 pm Roman time – their usual bed time in view of the unearthly early hours they both rise for morning prayers and then Morning Mass. Even Benedict still lives this way. But don’t worry, they may hear all kinds of shouts of triumph or whines of joy – their housemates will certainly watch this match!